There is no doubt about it, Ulster let Leinster off the hook on Saturday in a packed Aviva Stadium. Dan McFarland’s charges were probably - on the balance of it all - the better side on the day as the Irish Provinces contested an enthralling European Champions Cup quarter-final. 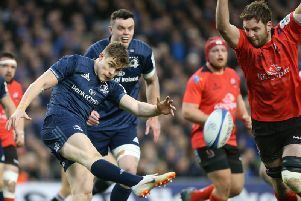 But instead it was defending champions Leinster who again, as they have so often before, found a way to take the win and secure a return date at the same venue in Dublin against Toulouse. Indeed, had the 21-18 scoreline gone the other way, it would be Ulster who would have had home Union advantage against the French side. That probably adds further to the major disappointment of losing the last eight tie against Leinster. And, of course, add further discussion around the big talking point of the entire weekend of European action - Jacob Stockdale’s failure to dot the ball down when he crossed the line early in the second half. At that stage Ulster led 13-11, Leinster were looking ragged and last year’s Six Nations record breaking try scorer and joint top try scorer in this season’s Heineken Cup going into the quarter-finals Stockdale produced a powerful break on the right. Having done all the hard work and beaten four defenders, attempting to place the ball down, he lost control of it and a glorious try scoring chance was gone. Ulster could have gone into a 20-11 lead at that stage, and while there was still plenty of time for Leinster to rally, one feels their goose may have been cooked. Sport can be a cruel game. Ulster could have been in a semi-final of Europe on the weekend of April 19/20 - and in Dublin. While head coach McFarland attempted to take the heat out of what was a key moment in the game, it was a major blunder from the 22-year-old winger. Earlier in the day, fellow Irish international winger, Keith Earls, scored a crucial try for Munster against Edinburgh - diving in at the corner with two hands on the ball - Munster are in the semi-finals later this month. Stockdale apologised to Ulster fans on instagram yesterday (see page 52). You can understand how he feels and Ulster fans rallied around him on social media to offer support. It is a mistake he will never make again. How costly the error was or could have been, can only be speculated, the focus for Ulster this week now returns to the Guinness PRO14 and qualification to next year’s Champions Cup and a league championship play-off. Ulster went toe-to-toe with one of the best clubs in Europe on Saturday, as they have throughout the competition. It was a performance to be proud of, even in defeat. How they react from the massive disappointment will be crucial over the coming weeks. They travel to Scotland for crucial back to back games against Glasgow and Edinburgh - both beaten quarter-finalists in the Champions Cup and also like Ulster fighting for their places in Europe next season. Ulster’s last game of the regular PRO14 league season is against defending champions Leinster, already in the semi-finals - completing a difficult run in for them. Their character and never say die attitude was not wanting against Leinster in Dublin on Saturday - they need to find it in abundance over the next few weeks.